Only a couple of blocks from my house, I walked by a black 560SEC with a tan interior in really good condition earlier this week—a good enough reason as any to write this post. For 1986, Mercedes-Benz’s big W126 S-Class coupe gained an upgraded 238 bhp M117 5.5 liter/338 ci Bosch K-Jetronic fuel injected V8 paired with a four-speed automatic transmission. The mid-cycle refresh also differed cosmetically from previous years with the addition of flush-face halogen headlamps and integral headlight wipers. 0-60 came in a sprightly 7.5 seconds in the 3,900-pound car while mileage was a predictably bad 14 city/16 highway by the standards of the day (12/15 by modern standards). With the large 23.8-gallon fuel tank, range was between 290 and 320 miles with a 10% reserve. Standard exterior and mechanical equipment on the $58,700 560SEC (about $129,700 in today’s dollars—a modern S550 4MATIC coupe starts at $119,900) included four-wheel anti-lock disc brakes and 215/65VR15 tires on 15-inch “fifteen slot” alloy wheels. Interior equipment included electronic automatic climate control (said to be less effective than you’d expect), an electronically adjustable steering column, cruise control, driver’s side airbag, dual-stage heated front seats, leather steering-wheel and shift-lever trim, and a Becker Grand Prix AM/FM stereo radio with cassette player and power antenna. Optional equipment included sun roof, power rear sun shade, front passenger air bag, and California emissions. There is decent club support for the 560SEC, as there is for almost all Mercedes-Benz’s. 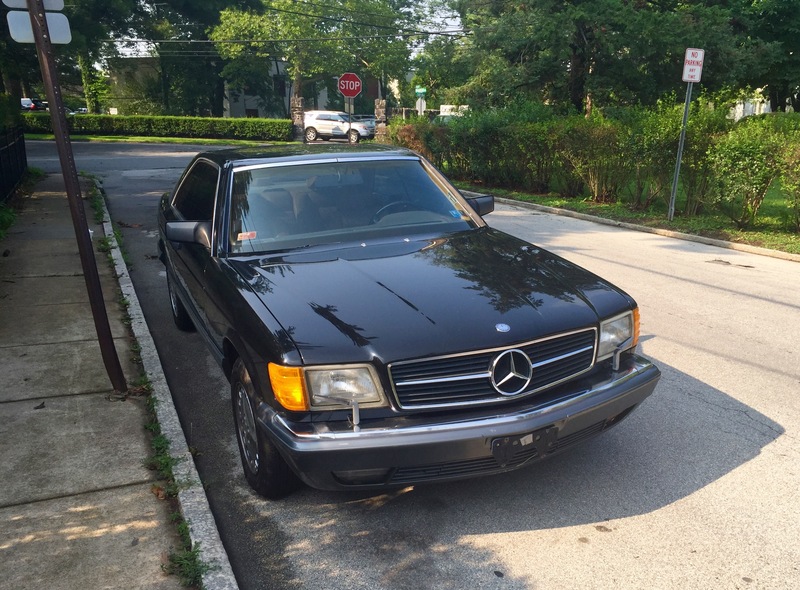 According to Hagerty’s valuation tools, all the money for a 1986 Mercedes-Benz 560SEC in #1 condition is $15,500, with a more normal #3 condition car going for $7,700. 560SECs frequently show up for sale in the Hemming’s Motor News classifieds and on eBay Motors: as I write this in July 2015, there’s a black 560SEC with a beige interior and 97,000 miles listed on Hemmings for $14,000. Make mine Black Pearl, please.